Published 2009 by R.G. and F.J. Richardson, soft cover, 326 pp. 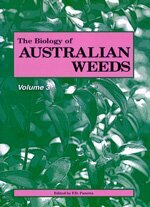 Detailed reviews on sixteen more of Australia's worst weeds. Main headings are: name; taxonomy; description; history; distribution; habitat; growth and development; reproduction; hybrids; population dynamics; genetics; importance; legislation; weed management - herbicides, other treatments, natural enemies, integrated pest management and references. Ligustrum lucidum Aiton and Ligustrum sinense Lour.